Quality kit for a compact price. 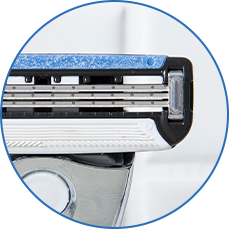 We deliver quality razors to your door, every month, sharp. 3 ceramic-coated carbon steel blades get to work for an exceptional shave. Lubricating strip with Vitamin E & Aloe helps the razor glide over the skin. 3 ceramic-coated carbon steel blades get to work for an exceptional shave. The vitamin E infused aloe vera strip soothes and smoothes. You choose a razor - either 3 or 5 blades. We send you the handle and your first cartridge kit. 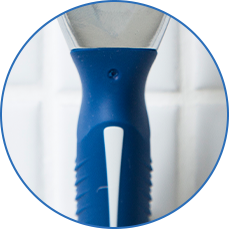 You stop paying for expensive brand name refills - as we deliver the perfect shave to you every month. Why are your razors so good? We work closely with leading manufacturers to create great value, no fuss products. A quality shave at a smart price. Yes, we have lots of female customers. Your first delivery contains a handle and 4 heads. Around 30 days later we deliver your replacement blades. I signed up for a first month discount - what are the terms? Your discount voucher gives you your first kit at the reduced price. What is the delivery method and how long does it take? The delivery is 2nd class mail and usually takes 2 - 3 days.